U.S. Hits Russian Oligarchs And Officials With Sanctions Over Election Interference : The Two-Way The Trump administration is laying sanctions on 38 Russian oligarchs, government officials and business entities, citing "the Kremlin's malign agenda." 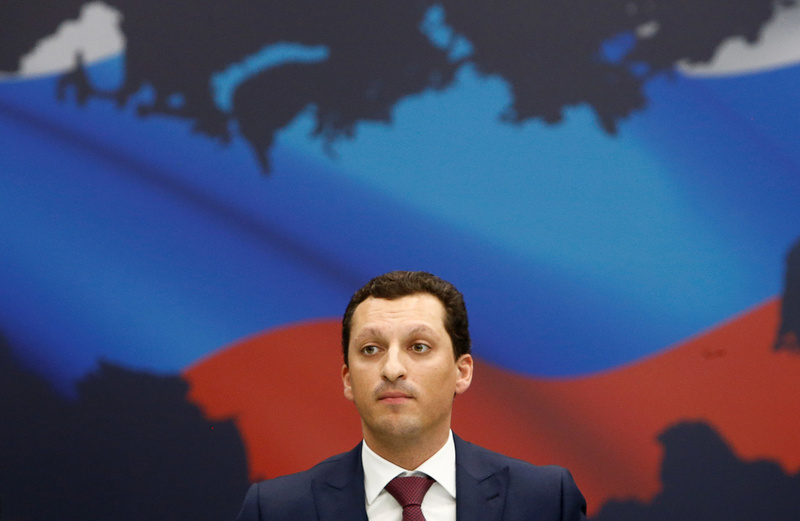 Kirill Shamalov, Russian President Vladimir Putin's son-in-law, is included in new U.S. sanctions. He's seen here in 2016. The Trump administration is laying sanctions on 38 Russian oligarchs, government officials and business entities, citing "the Kremlin's malign agenda" that ranges from malicious online campaigns and efforts to undermine democracy to its actions in eastern Ukraine and Syria. Seven Russian oligarchs and the 12 companies they own or control are on the new sanctions list. So are 17 senior Russian government officials, along with a government -owned weapons trading company and its subsidiary bank. Senior Trump administration officials who delivered a background briefing about the sanctions on Friday morning said they were punishing powerful and connected figures in Russia because of "the totality of the Russian government's ongoing and increasingly brazen pattern" of disruptive actions on an international scale — most notably, its efforts to subvert democracies. The move by the Treasury Department's Office of Foreign Assets Control targets members of Russia's elite, including Kirill Shamalov, the husband of Russian President Vladimir Putin's daughter, who famously received a loan of more than $1 billion from state-owned Gazprombank. Shamalov's name has also been indirectly linked to U.S. Commerce Secretary Wilbur Ross, through the Paradise Papers — a trove of financial documents leaked from an offshore law firm that emerged last year. The Paradise records showed that while Ross had divested himself of many holdings when he took office, he held on to a stake in the shipping company Navigator Holdings through a chain of companies in the Cayman Islands. In turn, Navigator was found to be earning around $20 million annually to ship gas for a Russian company named Sibur — which is co-owned by Shamalov. "Secretary Ross applauds the strong sanctions being put in place to counter Russian activities against the United States and our interests. As previously reported, he has divested from and has no interest in Navigator Holdings, or in his former firm, or the funds that held these investments. Secretary Ross is committed to the highest ethical standards in service to the American people." The list also names Oleg Deripaska, a businessman who has been linked to President Trump's former campaign manager, Paul Manafort. The Treasury says Deripaska has operated on the Russian government's behalf; it also cited "allegations that Deripaska bribed a government official, ordered the murder of a businessman, and had links to a Russian organized crime group." Because of the sanctions, assets held by the individuals in the U.S. will be frozen; Americans are also barred from doing business with those named in the list. Foreigners who facilitate large transactions on their behalf could also face sanctions, the U.S. said on Friday. "The Russian government engages in a range of malign activity around the globe, including continuing to occupy Crimea and instigate violence in eastern Ukraine, supplying the Assad regime with material and weaponry as they bomb their own civilians, attempting to subvert Western democracies, and malicious cyber activities. Russian oligarchs and elites who profit from this corrupt system will no longer be insulated from the consequences of their government's destabilizing activities." The White House says that it has now sanctioned 189 Russian-related individuals and entities for offenses that range from undermining elections to its dealings with Syria and its actions regarding both Ukraine and North Korea. Rumors had been swirling that the U.S. was preparing such a move. On Thursday, Putin's spokesman, Dmitry Peskov, was asked whether Russian oligarchs have been in touch with the Kremlin and Putin about increased levels of scrutiny from U.S. agencies. Peskov replied, "I think the phrase 'Russian oligarchs' is inappropriate." A better term would be "representatives of big business," Peskov said, according to Tass. And anyway, he added, he had no knowledge of such people raising concerns about American law enforcement. Igor Rotenberg is being designated for operating in the energy sector of the Russian Federation economy. Rotenberg acquired significant assets from his father, Arkady Rotenberg, after OFAC designated the latter in March 2014. Specifically Arkady Rotenberg sold Igor Rotenberg 79 percent of the Russian oil and gas drilling company Gazprom Burenie. Igor Rotenberg's uncle, Boris Rotenberg, owns 16 percent of the company. Like his brother Arkady Rotenberg, Boris Rotenberg was designated in March 2014. Kirill Shamalov is being designated for operating in the energy sector of the Russian Federation economy. Shamalov married Putin's daughter Katerina Tikhonova in February 2013 and his fortunes drastically improved following the marriage; within 18 months, he acquired a large portion of shares of Sibur, a Russia-based company involved in oil and gas exploration, production, processing, and refining. A year later, he was able to borrow more than one $1 billion through a loan from Gazprombank, a state-owned entity subject to sectoral sanctions pursuant to E.O. 13662. That same year, long-time Putin associate Gennady Timchenko, who is himself designated pursuant to E.O. 13661, sold an additional 17 percent of Sibur's shares to Shamalov. Shortly thereafter, Kirill Shamalov joined the ranks of the billionaire elite around Putin. Andrei Skoch is being designated for being an official of the Government of the Russian Federation. Skoch is a deputy of the Russian Federation's State Duma. Skoch has longstanding ties to Russian organized criminal groups, including time spent leading one such enterprise. Viktor Vekselberg is being designated for operating in the energy sector of the Russian Federation economy. Vekselberg is the founder and Chairman of the Board of Directors of the Renova Group. The Renova Group is comprised of asset management companies and investment funds that own and manage assets in several sectors of the Russian economy, including energy. 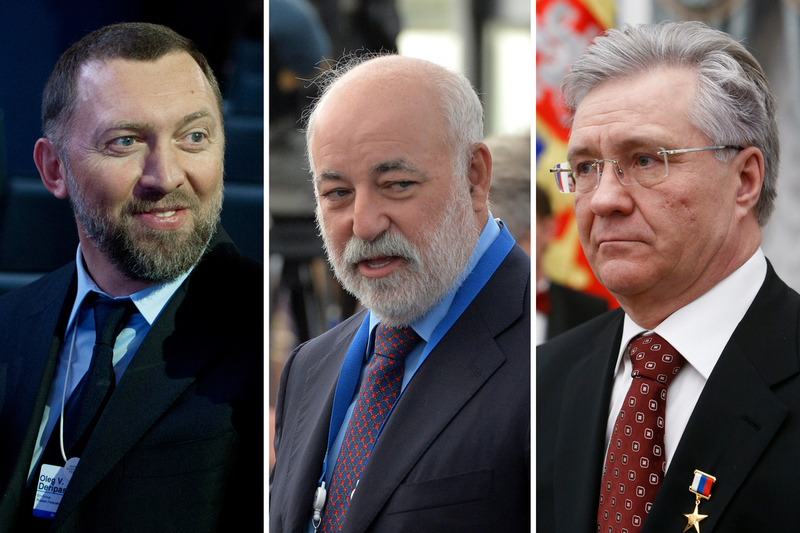 In 2016, Russian prosecutors raided Renova's offices and arrested two associates of Vekselberg, including the company's chief managing director and another top executive, for bribing officials connected to a power generation project in Russia. Basic Element Limited is being designated for being owned or controlled by, directly or indirectly, Oleg Deripaska. Basic Element Limited is based in Jersey and is the private investment and management company for Deripaska's various business interests. EuroSibEnergo is being designated for being owned or controlled by, directly or indirectly, Oleg Deripaska and EN+ Group. EuroSibEnergo is one of the largest independent power companies in Russia, operating power plants across Russia and producing around nine percent of Russia's total electricity. United Company RUSAL PLC is being designated for being owned or controlled by, directly or indirectly, EN+ Group. United Company RUSAL PLC is based in Jersey and is one of the world's largest aluminum producers, responsible for seven percent of global aluminum production. GAZ Group is being designated for being owned or controlled by, directly or indirectly, Oleg Deripaska and Russian Machines. GAZ Group is Russia's leading manufacturer of commercial vehicles. Agroholding Kuban,located in Russia, is being designated for being owned or controlled by, directly or indirectly, Oleg Deripaska and Basic Element Limited. Renova Group is being designated for being owned or controlled by Viktor Vekselberg. Renova Group, based in Russia, is comprised of investment funds and management companies operating in the energy sector, among others, in Russia's economy. Rosoboroneksport is a state-owned Russian weapons trading company with longstanding and ongoing ties to the Government of Syria, with billions of dollars' worth of weapons sales over more than a decade. Rosoboroneksport is being designated under E.O. 13582 for having materially assisted, sponsored, or provided financial, material, or technological support for, or goods or services in support of, the Government of Syria. Alexey Dyumin is the Governor of the Tula region of Russia. He previously headed the Special Operations Forces, which played a key role in Russia's purported annexation of Crimea. Dyumin is being designated pursuant to E.O. 13661 for being an official of the Government of the Russian Federation. Vladimir Ustinov is the Plenipotentiary Envoy to Russia's Southern Federal District. Ustinov is being designated pursuant to E.O. 13661 for being an official of the Government of the Russian Federation. Timur Valiulin is the head of the General Administration for Combatting Extremism within Russia's Ministry of Interior. Valiulin is being designated pursuant to E.O. 13661 for being an official of the Government of the Russian Federation.